The job of an alarm dog is to detect and announce any person approaching the area he serves. He is useful in situations where an alarm is needed but where biting, or even the threat of biting, could not be permitted. Examples are places where the proprietor needs to know of each arrival but, because the callers are few, does not spend time watching the entrance. Because such a dog need not offer the threat of physical protection, there are no minimum requirements for size and strength. One of the small breeds can be as good an alarm dog as the largest dog. There are obvious advantages to a smaller dog in some situations. The smaller dogs are usually longer lived than the larger ones and often have more robust constitutions. Even the Toy breeds come in such a variety of coats that they can take all extremes of temperature such as our hot Miami weather. You would not be afraid of a dog that turns tail and runs from you, neither would anyone else. The dog who barks and runs away from the advance of a stranger may make a good alarm dog, but he could hardly be suitable candidate for the second classification of a personal protection dog, the dog who provides a threat as well as an alarm. Although the threat dog should not be overly aggressive, he must have the courage to stand his ground staunchly against anyone who tries to bluff his way past him. 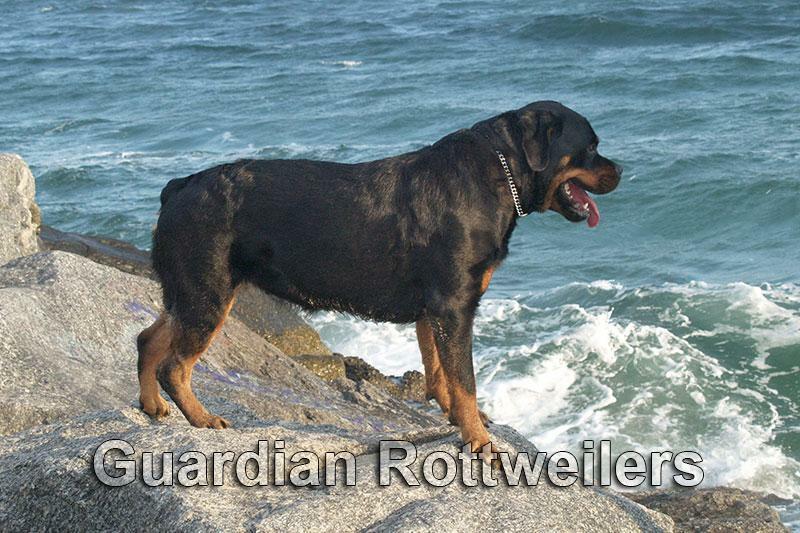 This need for courage and alertness means that much care must be used in selecting and training the dog. In considering first the general type of dog for the job, remember that, in posing a threat, a dog’s attitude is more important than his size. True, there is something impressive about a large dog standing firmly in the path of an intruder. But there is something equally impressive about the right kind of a small terrier who appears ready for violent action. However, size itself can be quite a deterrent and, if a smaller dog is your choice, it is doubly important that he be right physically and temperamentally. A true man-stopper does not merely show a willingness to fight. His job is to stop a man, if necessary, by winning a fight. Such a dog must have a strong sense of responsibility. Unless he feels responsible, a dog may be easily distracted from his purpose of physical defense. He must possess awareness, be keenly alert and aware of situations that develop. Decisiveness, it’s not enough for him to be aware and concerned, he must act with sufficient force. Courage, he must be able to stand up to threat and pain. Capability, he must have the mental and physical abilities to be a formidable opponent. Reasonableness, when you admit someone to your premises, your dog should respect your judgment but remain alert. The maniacal, uncontrollable dog is not only dangerous.. he’s useless, being shut away much of the time when his presence would be a comfort. To find a dog that naturally possesses these qualities so as to be a suitable candidate for protection training at this level can be very difficult. 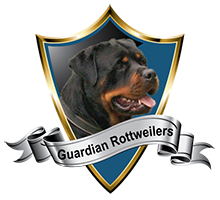 At Guardian Rottweilers we only accept dogs into our protection training program, that have been evaluated by us and qualified as having potential for the work.